Fast forward to today when the reverse tends to happen. Many films overprioritize their special effects but forget to begin from a quality script and craft memorable characters. Without starting there, all you’ve got is an exotic Lamborghini on the outside with a lawnmower engine failing to chug it along. Though Hollywood is currently addicted to eye candy, special effects should be a complement rather than a replacement. Matt Walsh as Pete in “Into the Storm”. “Into the Storm” is directed by Steven Quale. We’ve only seen him in the director’s chair once before at the helm of “Final Destination 5,” but he also served as a visual effects supervisor on “Avatar.” “Into the Storm” opens with a tense and well-executed introductory scene, but goes downhill from there. The film is written by John Swetnam and truly that’s where the problem lies. He’s a young Hollywood buck who has only inked one film you’ve never heard of (a 2013 horror film called “Evidence”) and now this film along with “Step Up All In.” Surprisingly, both of these 2014 films actually released on the same exact day (Aug. 8, 2014). His three films so far are all over the place. With “Into the Storm,” this guy was in over his head and was the wrong writer for the job. Drawing comparisons to 1996’s Oscar-nominated “Twister” with Helen Hunt and Bill Paxton, “Into the Storm” falls victim to what most people thought it would: It’s all eyes and no heart. 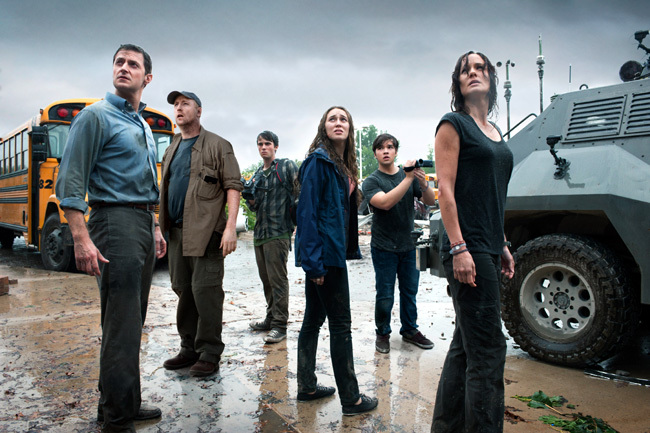 Left to right: Richard Armitage, Matt Walsh, Max Deacon, Alycia Debnam-Carey, Nathan Kress and Sarah Wayne Callies in “Into the Storm”. “Twister” prioritized its story and characters first with special effects second. “Into the Storm” reverses the formula and focuses so much on special effects that it fails to find the foundation of a rich story and memorable characters. Some 18 years later, I still remember Helen Hunt and Bill Paxton’s complicated professional/personal relationship and the lady (Jami Gertz as Dr. Melissa Reeves) who got in between and stood no chance to relate. Some 6 days since I’ve screened “Into the Storm,” I can vaguely recall critical plot elements and the characters who attempted to propel them along. “Twister,” by the way, had a $92 million production budget and raked in $494 million worldwide with a No. 1-ranked $41 million opening weekend. 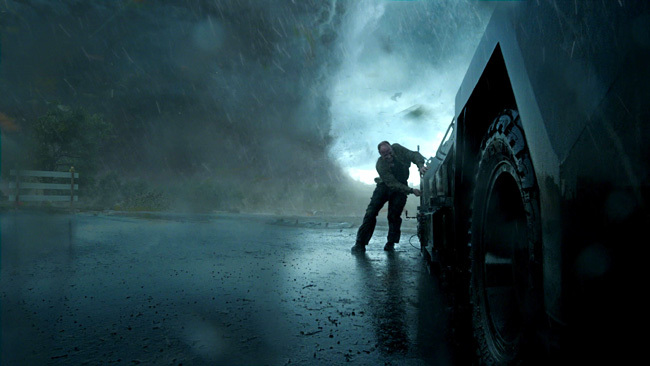 “Into the Storm” had a $50 million production budget with a No. 3-ranked $18 million opening weekend and a $26 million worldwide capture with 3 days in release so far. As for the characters, Chicagoan Matt Walsh as Pete is obsessed with storm-chasing glory and his life’s work: the Titus. He designed it to be the perfect vehicle to withstand Mother Nature at her worst. Pete’s unhealthy addiction cost the life of his nervous cameraman who had the better judgment to turn back but didn’t because he was trying to impress his boss. Sarah Wayne Callies (left) and Richard Armitage in “Into the Storm”. As a character, Pete’s biggest problem is he was doing it all for selfish glory. When faced with certain doom and handing over a Flash drive with allegedly life-saving data on it, you never got the sense that anything he did would actually make a difference in the real world. That message was subtly implied between the lines without being able to believe it. 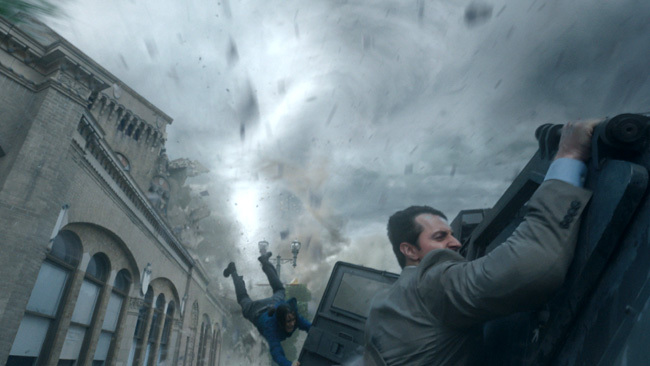 With a mostly no-name cast and without the “A”-list star power of a Helen Hunt or Bill Paxton, “Into the Storm” tried to rely on a “B”-list Richard Armitage as its primary draw. Some movies – like the recent found-footage film “Earth to Echo” – try to sell you on having such a unique concept that they don’t need “A”-list stars. Sometimes that proves to be true and sometimes it doesn’t, but “Into the Storm” can’t pull this off. Sarah Wayne Callies as Allison was an interesting character with potential, but she ended up being a plot point who goes nowhere. She’s attractive, a single mom, has lots of college degrees and is devoted to the data of her storm-chasing work. The team has accomplished nothing in the past year and the high-pressured gun is on her to find the mother lode. 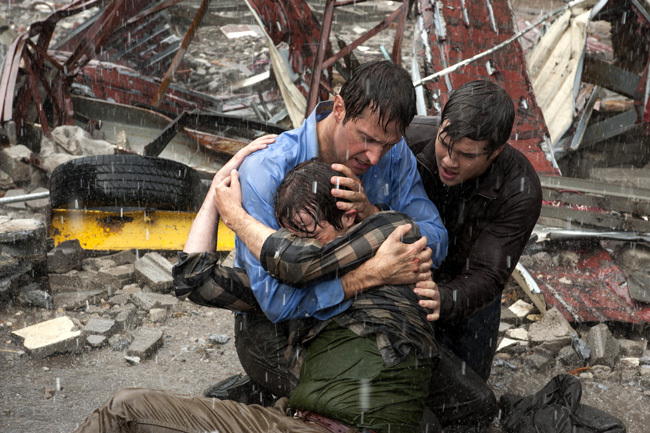 Max Deacon, Richard Armitage and Nathan Kress in “Into the Storm”. Her daughter is at home and misses her dearly, but Allison becomes no one’s romantic interest – as you could have easily seen coming – and her daughter becomes a manipulative phone call at the end of the film just to tell her that mommy’s still alive. You feel nothing for the two. These are minor moments that attempt to draw emotion in a film that only succeeds at having impressive special effects. Bonus comedy-relief characters Kyle Davis as Donk and Jon Reep as Reevis were the amateur hillbilly storm chasers. They were funny amid so much doom and gloom and were perhaps the most memorable characters in the film. That’s a problem. And then there’s the teenage love story with Alycia Debnam Carey as Kaitlyn and Max Deacon as Donnie. A high school boy fawns over a high school girl when he thinks he never has a chance with her, but the script weaves together an artificial way for them to need each other and spend time growing close. While cute, it’s hollow and devoid of anything real or memorable. 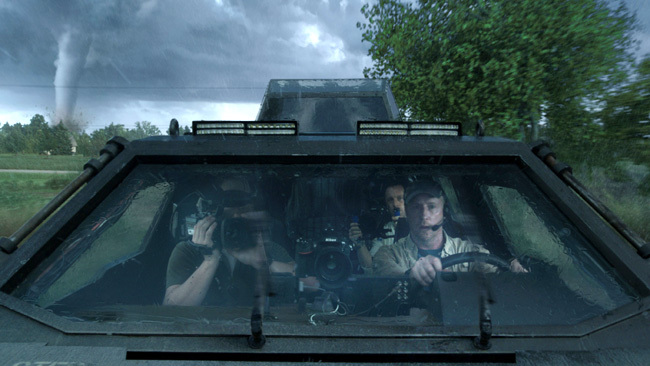 Matt Walsh (front right) in “Into the Storm”. The film needed one or two “A”-listers and an original story we could feel and rally behind. “Into the Storm” attempted to do this with Richard Armitage as Gary. “Into the Storm” tries to convince you of his character evolution from a busy businessman to an emotionally present father and savior of his two sons. But in an 89-minute film, the only scene that got it right is when he’s literally trying to pull his son away from the claws of death. While that scene felt genuine, it was only one among a feature-length film of otherwise unmemorable fluff. “Into the Storm” stars Richard Armitage, Sarah Wayne Callies, Matt Walsh, Alycia Debnam-Carey, Arlen Escarpeta, Max Deacon, Nathan Kress, Jeremy Sumpter, Kyle Davis and Scott Lawrence from director Steven Quale and writer John Swetnam. The film is rated which is rated “PG-13” for sequences of intense destruction and peril and language including some sexual references. It has a running time of 89 minutes and and opened on Aug. 8, 2014.